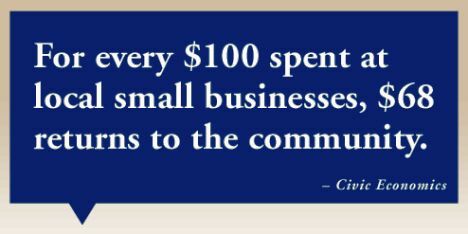 #1 Profits from small businesses get put back into our community. Raising our kids, Supporting our civic organizations, Paying taxes for public programming/buildings/referendums, Spending our hard earned money on products and services you make or refer as trusted local providers who are earning their living by running their own business. #2 If we don’t make ends meet, we have no other stores to keep us afloat. We count on consistent sales to keep the doors open. We do not have other more popular stores in busier areas to pull money from or to provide a blanket marketing campaign. If we are not making sales each week, there is only so much we can do to go into debt ‘hoping’ for the local demand of what we are passionate about providing. Feeding our kids, Putting gas in the car, Regular dental and doctor checkups all depend on actually making a paycheck. Actually making a paycheck depends on creating sales beyond covering storefront rent, liability insurance, business licenses and cost of buying goods to sell. Your weekly purchase matters. And every box order counts. #2 You Matter to Us! When small businesses provide a service, we do it with passion and custom care. We personalize your experience, take time to cultivate the best quality product and provide personalized service week after week. You are the boss. You determine our success.